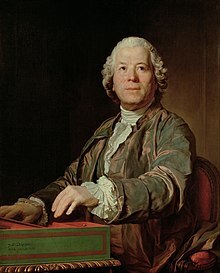 Christophus Willibald Gluck, a Iosepho Sifrède Duplessis pictus (1775). Museum Historiae Artis (Theodisce Kunsthistorisches Museum) Vindobonae. Orfeo ed Euridice (Francice Orphée et Eurydice) est opera in actibus tribus de mytho Orphei tractans, a Christophoro Willibaldo Gluck apud libellum Ranieri de' Calzabigi composita. In genus azione teatrale, quod operas de rebus mythologicis choros et saltationes habentis, comprehendit, usitate digeritur. Artificium primum Vindobonae die 5 Octobris 1762 peractum est. Orfeo ed Euridice est prima ex "operarum correctionis," quibus in loco argumentorum abstrusiorum et musicae involutissimae operae seriae "simplicitatem nobilem" in musica et dramate substituere conatus est. Haec opera, omnium conatuum Gluckianorum, populo est gratissima, atque una ex eis quae operas Germanas insequentis maxime moverunt. Inter operas quibus sunt variationes eius argumenti—praecipue subterraneus liberandi cursus, quo heroi animi motus modulari vel celare opus est—sunt Tibia magica Volfgangi Amadei Mozart, Fidelio Ludovici van Beethoven, et Das Rheingold Ricardi Wagner. Orfeo ed Euridice, quamquam opera apud libellum Italianum primum imposita, genus operae Francicae multum repetit, praecipue in usu recitatorii adiuncti et in generali sollertiae vocalis absentia. Annos quidem duodecim post primam perfunctionem, Gluck operam ad accommodandos gustatus spectatorum Lutetiensium in Académie Royale de Musique apud libellum Petri Ludovici Moline retractavit. Huic retractationi nomen Orphée et Eurydice datum est, et mutationes generum vocis et orchestrationis effectae sunt. Francisci Algarotti Libellus de Opera (1755) fuit pro monitu qui correctiones a Gluck excogitatas exspectavit et sustinuit. Tabula a Ioanne Stephano Liotard picta. Rijksmuseum. Paulina Viardot personam Orphée canit. Cairns, David. 1999. Servitude and Greatness 1832–1869. Berlioz, 2. Berkeleiae Californiae: University of California Press. ISBN 978-0-520-22200-7; ISBN 978-0-520-24058-2. Durazzo, Angela Valenti. 2004. La premiata ditta Durazzo & Gluck. In I durazzo da schiavi a dogi della Repubblica di Genova. Principatu Monaci. Hayes, Jeremy. 1992. Orfeo ed Euridice. In The New Grove Dictionary of Opera, ed Stanley Sadie, 3:744–749. Londinii: Macmillan. ISBN 978-1-56159-228-9. Hayes, Jeremy. Orfeo ed Euridice. In Grove Music Online, ed. L. Macy. Situs lucrativus. Holden, Amanda, Nicholas Kenyon, et Stephen Walsh, eds. 1995. The Penguin Opera Guide. Penguin. ISBN 978-0-14-025131-9. Holden, Amanda, et Alan Blyth. 1993. The Viking opera guide. Noci Eboraci: Viking. ISBN 0-670-81292-7. Holoman, D. Kern. 1989. Berlioz. Cantabrigiae Massachusettae: Harvard University Press. ISBN 978-0-674-06778-3. Loppert, Max. 1979. Orfeo ed Euridice. In Opera on Record, ed. Alan Blyth. Londinii: Hutchinson. ISBN 0-09-139980-7. Mestron, Hervé. 1994. "Archaisms and innovations in the orchestration of Orfeo," commentarius a Mary Pardoe conversus. In notis disci Ioannis Claudii Malgoire. Astrée. Noiray, Michael. 1994. A musical manifesto, commentarius a Mary Pardoe conversus. In notis disci Ioannis Claudii Malgoire. Astrée. Orrey, Leslie, et Rodney Milnes. 1987. Opera, a concise history. Londinii: Thames and Hudson. 0-500-20217-6. Walsh, T. J. 1981. Second Empire Opera: The Théâtre Lyrique, Paris, 1851–1870. Londinii: John Calder. ISBN 978-0-7145-3659-0.